DETAILS To save the hassle of running around looking for the necessary items in the midst of a craft project, I keep what I’m going to need in a craft basket. Scissors, crayons, glue, markers, hole punch, ruler, tape (masking and scotch) pencils with erasers. ALWAYS be organized for any project with all necessary materials gathered before you and your grandchildren sit down to do them. Otherwise you’re going to be running all over hunting for things while your joy turns to frustration and you are prematurely exhausted. Aside from a small basket of essentials, I also have STUFF BASKET, full of things some child might be inspired to use in a creative way. There are wiggly eyes in here, pieces of felt in different colors, pipe cleaners, popsicle sticks, origami paper, colored tissue paper, colored construction paper, paper shred in different colors and textures, brown paper lunch bags, Styrofoam balls, different colors of yarn, fake snow flakes, glitter, tacky glue, interesting wrapping paper, scraps of material, scraps of the netting that has held my avocados, red pom poms, foam brushes, decoupage finish, metal containers to cover with decoupage and cotton batting That’s what’s on hand as I write. I will admit to walking through the craft store and just picking up anything that strikes my fancy. Grandmothers look at stuff and get creative ideas too. Keep your eyes open and put what looks interesting in your STUFF BASKET. 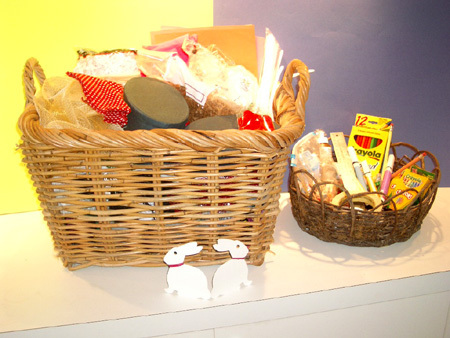 MATERIALS NEEDED One small basket, one large; Scissors, crayons, glue, markers, hole punch, ruler, tape (masking and scotch) pencils with erasers - in the basket.